UPDATE: Combined PMF, ISF, Sunni tribal fighters under the command of Iran’s Quds Force today took control of the western neighborhoods of Tikrit, leaving only one area, including a palace complex once used by Saddam Hussein, in the hands of ISIL insurgents, the New York Times reported. UPDATE: Not surprisingly, the Press TV report that the coalition has taken control of Qadisiyah on Wednesday 11 March was not accurate. The coalition is fighting ISIL insurgents for the control of Qadisiyah as of Saturday 14 March. 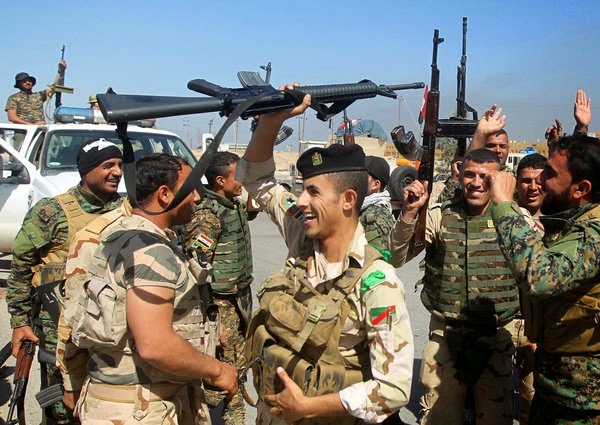 In the largest ground operation to date against ISIL insurgents, and after a week of intense fighting, the Iran-led coalition of Iraqi Shia militias and security forces, led by Quds Force General Qasem Soleimani, have retaken large areas of Tikrit. On Tuesday, the coalition forces had recaptured the town of al-Alam on the northern edge of Tikirit, encircling the city. Iran’s Press TV reported today that the militia and security forces have entered the strategic city from multiple directions, and have taken control of al-Qadisiyah neighborhood. The report also said that the streets of Tikrit are “covered with dead bodies of ISIL terrorists.” Earlier, the New York Times reported that ISIL fighters had begun retreating form Tikrit. A big heartfelt thank you to the Anti-ISIS coalition. May they always be victorious. @5:14 Anon, Indeed true. What The Iran-Iraq bloody war taught us with all the martyrs and good souls who perished from both sides is the how to fight. It produced a certain kind of Westpoint like tradition and institute in Iran were commanders know how to lead and how to prevail in a battle. I believe only those countries that have experienced this are formidable forces and military tradition and legacy plays a significant role on how the military operates. For the same reason I do not believe Saudi Arabia or any Gulf force can lead an effort like this on the field even if they have had foot on the ground in Iraq and I believe that is what make them worried. This e who have experienced war and have built doctrine on their experience are now leading the battle. The type of Militia and structure and the type of battle and battle plan is what has been practiced and experienced during the Iran-Iraq war and is a valuable asset which is not purchased by petro dollars but gained by blood and hardship. Quite a few speculative and indeterminate American perspectives, on where the IRGC-QF/Shia militias will be directed following the Battle of Tikrit. According to comments made this week by IRGC Maj. Gen. Jafari, identified objectives are Fallujah and Mosul. Iranian New Year 1394: Happy New Year!